One of the best supersonic bullets for 300BLK. 147 is too heavy for optimum performance...110 is too light. At 125, these are perfect!! This .308” diameter projectile by Speer features a total metal jacket. 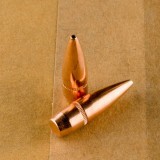 Rather than leave the lead at base of this bullet exposed or covering it with a separate piece of jacket, Speer elected to completely and seamlessly envelop it via an extension of the rest of the bullet’s jacket. As the result this bullet is extremely accurate, and also doesn’t create remotely near the amount of vaporized lead that a conventional bullet would when fired. 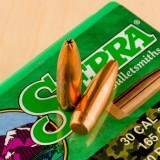 Speer was founded in 1943 when Vernon Speer started producing his own bullets to make up for the deficit in handloading components caused by the Second World War. 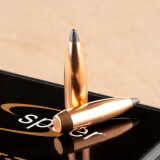 Although they’ve since expanded into the production of fully loaded ammunition, Speer has since day one of their operation been focused largely on the production of high quality rifle bullets. As such these 1,000 projectiles represent the culmination of the better part of eight decades’ worth of research, development, and commitment to providing hunters with the best of what the handloading market has to offer. The .308 Winchester round dates all the way back to 1953, but it remains one of the most reliable cartridges for medium-game hunting and target shooting. 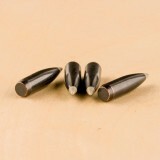 With speed, accuracy, and power, these rounds are used for a wide variety of game, from deer to black bear. 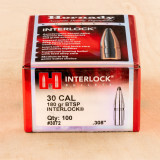 If you are going to reload your .308 cases, you need high-quality bullets that deliver accurate trajectories and smooth firing. 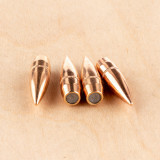 These military-spec 147-grain bullets are full metal jacket, non-magnetic, projectiles that deliver excellent performance in semi-automatic rifles. These are the same projectiles loaded in the M80 NATO rounds. 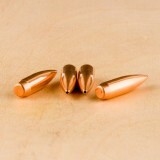 They feed smoothly and deliver consistent and tight grouping downrange. 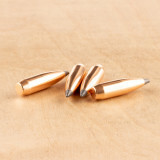 You’ll have 500 bullets that help you get the practice you need for your .308 Winchester rifle. 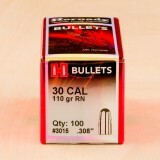 If you are going to reload your .308 Winchester cases, these bullets will give the performance you desire. 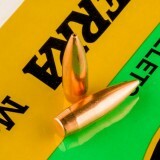 Although these bullets were originally intended for military use, you can now purchase them through our website. Many gun owners prefer military surplus ammunition, as they perform with more reliability, especially in autoloaders. After utilizing the Hornady OAL Length Gauge (with Hornady modified case) and the Hornady Bullet Comparator Body w/Insert to measure the Cartridge Base To Ogive (CBTO) in the chamber of my 300AAC Blk, and then reducing the CBTO by .02" - .025", I am getting very good results/groups with this projectile. 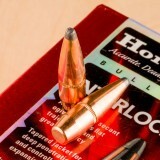 The top of the case mouth is well below the bullet cannelure of the finished cartridge. I'm using Lee FCD for crimping. The above is not instructional, but for general information only. You try this at your own risk. Most indoor and some outdoor ranges do not allow steel. These have none. .3 between high and low. Nice bullet, not one box contained 500! VERY disappointed that every box, purchased 4, was short. From 4 to around 12. Very poor quality control on packaging. The bullets, on the other hand, are good quality. Ogive does vary which results in random oal's. Variation isn't significant enough to cause accuracy issues as the load I used is capable of moa accuracy at 100 yards. Would I buy them again? Yes, but I surely wouldn't expect to receive 500 as the packaging states, thus my 3 star rating. Accurate bullet for my M1A. Packaging arrived in good condition, no spilled bullets. I will buy more, good price and timely delivery. Appear to be great bullets. They came in fine condition, no problems with box and bag. They look great, just what I was looking for. 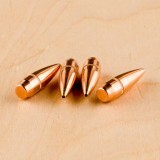 A working man's bullet for shooting and plinking in several rifles. Have not loaded any yet but plan to soon. 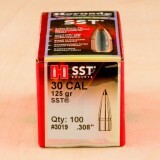 Great inexpensive 300 blackout bullet, loads well, consistent size. Will buy more. 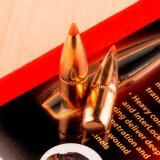 Great bullet but better yet these guys got there packing problems corrected, box in a box. Good job guys !!! I had about given up finding a source for inexpensive range ammo for my home brew .300 Blackout 16in AR, when I found these. Just ran a test batch of 50 with a low load out to 300yd with decent groups even with the crappy optic I was using. Plan to get more, I was using .223 rifle for 3 gun but now I can make a switch to Blackout with out going broke. Very happy. Seems like a nice bullet, but won't shoot for me. 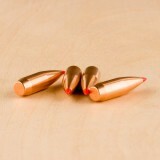 I purchased these bullets several months ago. I've been trying to work up an accurate load with different powders and have shot a lot of them in three different rifles. My latest groups were as big as ten inches at 200 yards, while my Nosler bullets gave me a two inch group with the same rifle. I'm sure they shoot well for some people, so I will sell them and let someone else have a try with them. I have placed two orders for General Dynamics 308 diameter bullets 147 grain full metal jacket boat tail, 500 bullets, 30 days apart. In the first order, the package arrived in pristine condition, with excellent packaging material to protect the internal plastic bag. The second order arrived today, the box was damaged and open on the seams and had been re-taped several times. The internal plastic bag was burst at the seams, appeared to have been wrapped with a thin sheet of paper, and the bullets were scattered throughout the box. 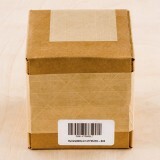 In my opinion, the quality of the shipping carton does not meet the standards for a 10 pound plus shipment. I shoot an H&K G-3 clone. 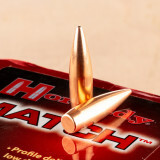 I reload a mix of military and civilian brass, with 40 grains of IMR 4007 or 40 grains of benchmark. Great prices a good product. Can't beat the price in these bullets. Pretty consistent. Great for plinking rounds. Great bullet for the money! Use these for .300 Blkout, Garand and AR10, works great for everyday range shooting and will definitely be getting more!!! Good bullet for the sale price. 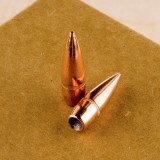 Not a match grade produced bullet but a good deal for the price and within the specs for a military issued round. 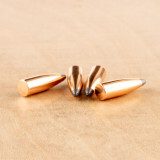 Great bullet for general reloading and shooting along with field testing of a rifle. I see some complaints about quality and accuracy , however I shoot these 147 grain FMJs in my M1A, with battle sights and group 1-1.5 inch groups at 100 yards. I use H4895 and IMR 3031 (my rifles favorite powder) and get consistent velocity and accuracy. Learned to shoot in the USMC and I do not have any problems with from this product offered by Wideners from General Dynamics. I was not planning on writing a review, especially after so many others were written complaining about the same issue, but Wideners sent me a email asking for one, so here is the good and the bad of it all. The quality of the projectile is very good and their sale price of $79 per bag of 500 is really inexpensive, and from the time I placed my order to when they were delivered to my front porch is S.E. Michigan was not even 2 full days. The problem was that it was immediately obvious that the 8" square cardboard shipping box had suffered quite a trauma in it's trip to my home. The box had probably 20 feet of clear packing tape going all around the bottom and up one side where the box had split open, it was not even close to being square anymore.There were 3 bags of 500pc each in the box, all appeared to be split at their seams, all the bullets just laying loose in the bottom, just as if the box were dropped onto the floor a few times until the plastic bags popped open and poured their contents out of the damaged shipping container. I am certainly not blaming Wideners for this, we all know how careless the shipping companies employees are, they don't care. But, I was prepared that this might happen since there were already so many complaints registered here. I knew I would have to accept the good with the bad. Wideners can fix this with some of their own clear packing tape, a short piece on the seam of each bag, to prevent it from bursting, a strip of tape around the top, bottom and down each side to hold the box together. have not loaded measured or weighed any of these bullets yet but they look to be quality bullets and the shipping was quick. off hand I'd say for the average garand or hk91 they would do nicely as plinking bullets because of the price, if you take the time to sort them properly you may even get some accuracy from them. This stuff is great, seen pretty consistent! Very good military style bullet for my M14. These bullets are very consistent and even though I have not had a chance to shoot them, I feel that they will be quite accurate. 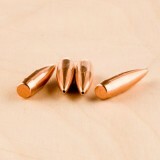 I loaded some ammunition for my 30-06 and .308 caliber M1 Garands with these projectiles and shot good groups. Accuracy is slightly better than with cartridges I loaded with the Hornady 150g FMJ. I use both IMR 4895 and H4895 powders for my Garand loads. Once I go through the 2,500 I have on hand, I will definitely order more. 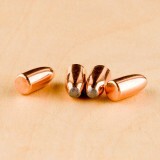 Better than expected for bulk inexpensive bullets.. Sample weights within 1 grain of each other. Received these earlier than projected...that is always a plus! However like others bag in box was split open. Grouped well at 300 yards considering the field grade Garand and the shooter. All rounds fired in that string were within the kill areas (head and heart) 4 inch inch groups 4 en bloc clips loaded with GI brass and these bullets. Very satisfied! Diameters were undersized up to .0005 resulting in 3+ MOA accuracy at 100yds from a precision rifle. Would not buy this product again. 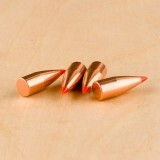 Nice bullets for the price! Examined these bullets when I received them and they are extremely nice and consistent. Very good value for the money. Only drawback was the plastic bags that they ship in split open in the shipping box. Look great weight is consistent but length is not. Only measured 30 bullets and They vary from 28.92 - 29.37 thats . 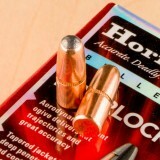 (.45 ) the Hornady bullets I used where only ( .21 ) difference out of 100 measured. Gen. Dynamics bullets not impressive. 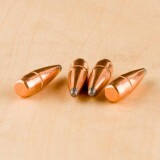 Two star quality, poor to average grouping, surpassed by other bullets you sell Disappointing. results, in my M- garands. 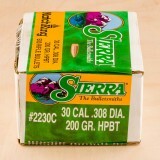 Ordered 2 bags while on sale, great price -no problem with open bags in my box. Did some weight checks & all were @ 148 + or - a few 10ths on a cheap electronic scale- very consistent, better than some brand names I've bought locally. If I'd had time to load and shoot -or count- i would add or subtract a Star. But these aren't for hunting or long range precision, -So - 5 stars for quality & price. I bought these because of the price thinking that ifs they weren't so good it would not matter. 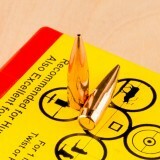 I was surprised how good these were.. great groupings and easy to reload new cartridges with these.. Overall major score here. They look amazing too. All my 300 blackout buddies want me to make ammo for them now because of how much cheaper it is to roll your own .300 blackout than to buy it. Keeping my 300blackout bullet cost down, these 147 gr bullets do just that. Will be reordering very soon. I received bullets within 2 days of ordering. I opened the box and found the bullets in an open bag with some packing so naturally my first concern was are they all here. I counted the billets and not only did I get the 500 I ordered but there were four extra bullets. Thanks Wideners for the fast and great service!! These bullets are nice for range time, and I like getting them at a good price. I wasn't so lucky about the tape holding my bullets in the box. Bullets fell out at the UPS Store, in my car, probably all the way back to Wideners. bullets for the 300 blackout! 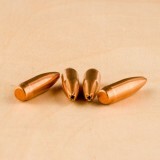 Very nice bullets for the 3 gun world! Loaded in the 300 blackout and they work and chamber perfectly without going broke! Will definitely buy more! Wideners served me well and got items to me quickly!!! 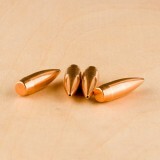 I use these for 308 range ammo. Load nice accurate. Close enough to use 149 grain recipes. Excellent quality and pricing coupled to very fast service and shipping. Thanx Wideners, don't really need to shop around with you as a supplier. Got what I ordered sooner than expected. Also 3 extra bullets bought them on sale. 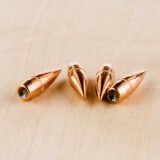 These bullets worked well for me as I reload 308 and 300 AAC. They are exceptional in both calibers. Thanks Widners. Wideners has come through for me again. Great quality and great price. The box was packed well and arrived fast. You won't find a better online company to deal with. 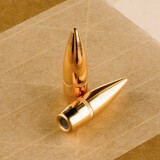 Very good bullet at a great price. 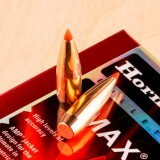 Good bullet for the money, used them in 30/06 and 308 M1 and M1A. This bullet loads easily and is consistent regarding COL. Price is good. No signs of over pressure, primers were CCI Small Rifle fired from a registered SBR with a 7.5 inch barrel and a Sup Arms gas Piston Operating System. I used in both 300blk and 308 win and it worked extremely well. Average group (1 in 12 ar10 20" barrel that shoot 168gr Sierra match king .25 moa) is about 1 moa which not bad at all. 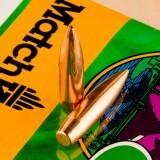 It is not the match bullet quality however no other bullet can beat this price. Average 148.2 gr. Dimensionally consistent in Dia and length. Shoot great in my M1 Garand. Weidner's could improve on their packaging quite a lot. The bag was ripped open and everything was rolling around loose in the box. Good thing the tape held. 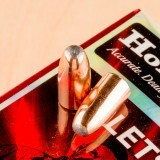 These bullets all weigh within 1/2 grain from each other and are perfectly concentric . Another big + is the jacket is copper not copper plated steel. The quality is great and I will be ordering more. I am not that far from Widener's in north Alabama. Still, I pulled the trigger on a thousand of these from an email ad on Thursday night, received a shipping notice via FEDEX on Friday, and they were delivered to my house at 8 p.m. on Saturday. I did not really need that much attention but it impresses me. I have not "miked", weighed, or used any of these. I trust the other reviews. They do look to be of the highest quality. I do want to add this, and I would appreciate verification from someone who has loaded these; the cannelure appears to be in the right place when compared to the Hdy bullets I have been using. The cannelure on the Hdy was too high for standard 7.62x51 OAL to feed a hungry FN FAL. They worked, but these should be spot on. Awesome bullets for my 300 BLK. Worked well in my 300 AAC. Reformed LC cases and Accurate 1680. 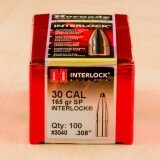 These bullets are great and work great for 300 blackout loads. 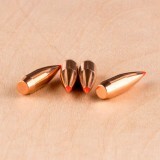 Excellent quality .308 FMJ bullets. 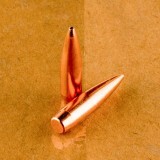 Excellent quality - very consistent weight from bullet to bullet. 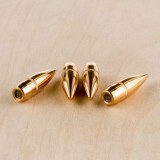 Great looking bullets and I got them on sale so I bought 1,000. Should shoot great in my M1 Garand and M1A...thanks Wideners!!!! MAIL CALL! 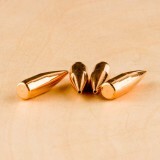 Bullets have arrived! I'm really starting to love Wideners, or is it Videners? 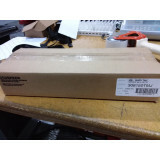 Anyway, my order of 500 147 grain General Dynamic FMJ-BT bullets just arrived. After weighing a hand full, most are in the high 147 to low 148 grain range, which is fine. I'm primarily loading them for sonic and subsonic training rounds. Uniform weight, point, and base. Should have bought more. Bought 1500 of these to load in my MCP 300 Blackout. The bullets at are .308, not .309-.312. No swagging needed. Well worth it for 30 cal bullets. These bullets shoot great in my Garand. For the price, they are uniform and clean. 500 just might not be enough! I will definitely order again. Nice product. I haven't loaded any of these yet, but they appear to be awesome for the money. 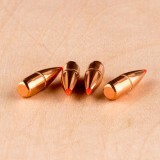 They look just like the Hornady 150 grain I gave been using but a lot cheaper. Now, if General Dynamics offer would offer some inexpensive 125 grain and 208 grain I would be happy. Fast service, fast shipping. The order wasn't correct on the shipping address and I was contacted within a half hour for the correct address. 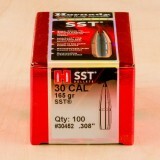 Found my new .300 Blackout super bullet, good quality and great price! Great service and shipping. 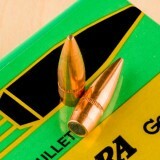 Very nice bullet, shoots slightly to left in M1 Garand compared to 145 GR Military surplus I was previously using. It is a good value. Great product ! Shipping and service is outstanding !!!! Greate product, at a good price. 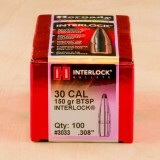 The best 300 blackout bullets I have found ! Excellent product. Fine construction. Very consistent size, weight, and configuration! This 500-round case of 308 diameter bullets are made by Armscor and manufactured in the Philippines. 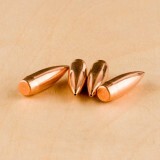 These .308 diameter bullets are 147 grain full metal jacket projectiles which have a copper alloy jacket, a crimped cannelure, and a soft lead core. Perfect for reloading your spent hunting and training casings, the 308 Win is a powerful bullet style great for a variety of applications. The Armscor organization has evolved over time, but its origin can be traced back to the early 1900's. At present, Armscor ships ammunition, firearms, and reloading components to countries all over the world. 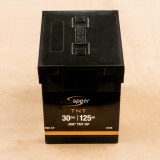 They continue to expand because shooters enjoy their high-quality products and their affordable prices. 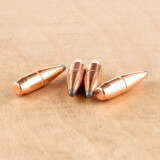 Order your 500-round bulk case of 308 Win bullets today! 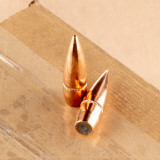 IMI .308 diameter bullets are a great option for your custom bench loads. These 147 grain full metal jacket boat tails from Israel Military Industries are the same projectiles loaded into the NATO M80 rounds. These are acceptable bullets for plinking and range training being both accurate and consistent. Israel Military Industries was established in 1933 and is fully owned by the Israeli government. IMI's products are qualified with the Israel Defense Forces, US Military, and NATO nations. Their Small Caliber Ammunition division offers complete lines of ammo that is in accordance with NATO, MIL-SPEC and IDF Standards. 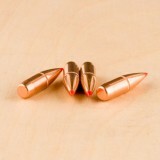 Pick up this 500 piece bag of 147 grain FMJBT projectiles and check out our selection of 308 Brass while you are here! Most indoors and some outdoor ranges do not allow steel. These have none. .3 difference between high and low. They are perfect to keep in mags for home defense or for plinking. If you want better quality pay more money for higher end. Bullets are great in my Krag, 03A3, and M1 with proper powder and load. I bought these to trial shoot in all of my 30 caliber rifles and have found with various powders used for each type of firearm they have worked well out to 200 yds. On the bench I am getting .5 MOA with my Krag at 100 yds and 1 - 1.5 MOA at 200 yds. I bought 2000 for my 300 blackout. They're great for getting out to the range, shooting and staying familiar with your rifle without high cost. I've used 250 to 350 so far ( I shot my 150s first). Loading stays within cannelure with one setting. Very accurate out to 100 yds for my needs. They'd also be good for home defense. They are not for hunting. Exactly what I was looking for. Slight variation in lengths, but that make little difference for what I'm loading for and powder I'm using. Package arrived intact, and fast. I'm very satisfied with these and will probably buy more. I can't gripe about quality, for the price I paid I won't say a word. They look great, and if they load as good and shoot as good as they look what's to gripe about. You want long range, and tack driving quality, order the more expensive brands and long range bullets. Just saying, you get what you pay for and I've never been shafted by Wideners before. As others have mentioned, these bullets pretty much all weigh the same (for me it was 147.5 grains) but that the lengths vary somewhat. For me I had about 60 percent of them measure 1.12, 25 percent at 1.13 inches 10 percent at 1.11 and 5 percent at 1.10. There were 3 bullets lower than 1.10 out of a box of 500. 2 were 1.09 and one was 1.08. I expect groups will improve since these have been selected by length and weight, but math ammo this isn't. Took me about an hour to sort out the projectiles, so for me it was worth it. 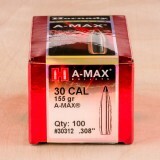 Just make sure your expectations are in check if you decide on purchasing this ammo. OAL's all over the place 1.108 to 1.135 in the sample of ten I checked. Terrible packaging, arrived with hole in box and bullets missing. Do yourself a favor and buy another brand. Nice bullets consistent weights around 148 but my lengths were all over the place. I was still able to load and stay within my OAL but if you buy these make sure you check twice. First time buying this brand. Bullit weight average 148. But when starting to reload I was getting different depths in seating? Started to measure bullet length, they ranged from 1.098 to 1.154 nothing consistent. Some of them had normal ball tips and some had tips sharp as throwing darts. Think I will stick with the general dynamics brand. Less of a headache seating them. Very good. 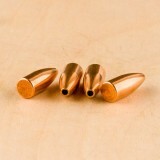 For the price, easy to load, rounds are uniform in weight and size. Loaded 360 rounds out of 500 with no problems. And the price is right .Will purchase again. Great bullet for the price! I started reloading 147's for my 300 blk some time ago and they were awesome. I found the right load and of all the weights Ive tried the 147 did the best for the price. And then they disappeared. So hard to get. 150's weren't the same. thankfully you guys have them in quantity and Im back to reloading. You can't go wrong with these 147's. 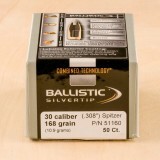 I bought 500 of these 147 gr bullets for casual shooting in 308 and 30-06 rifles. 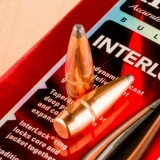 Having had good results with IMI bullets in the past I expect these will prove to be very accurate service grade bullets. 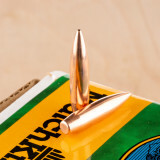 The .308 Winchester is one of the most successful and popular cartridges in the country. It was designed for speed, accuracy, and effective penetration, and it now holds a spot among top American hunting rounds. It’s used for a wide variety of game, including whitetail deer and black bear. 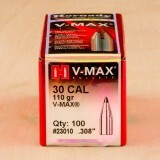 However, if you’re going to reload your .308 cases, you need to first make sure you have the best bullets available. This box gives you 2,000 bullets that deliver tremendous speed and consistency. 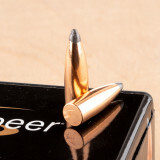 The 155-grain bullets have a hollow point design, which creates excellent terminal performance, as well as a boat tail, which helps it travel with greater accuracy. 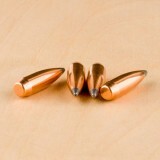 When loaded, these bullets can be used for hunting, but the manufacturer recommends them for match competition and training. 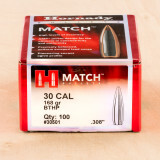 Hornady is one of the leading ammo brands in the country. They have a wide variety of ammo choices for many different purposes, and create cartridges and reloading supplies for both handguns and rifles. 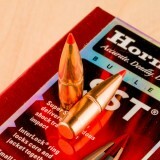 These 168-grain bullets from Hornady deliver the outstanding performance you expect and give you excellent results at the range. The AMP jacket has virtually zero variation in thickness, and the swaged lead core brings better balance, resulting in more accurate placement. With a boat tail, these bullets maximize accuracy and consistency. 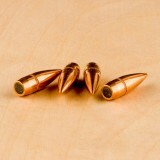 In this pack, you'll get 1800 bullets ready to load. 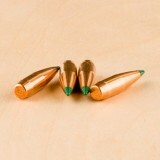 The .308 is an excellent round for hunting and target shooting. It delivers straight, reliable trajectories and has some of the best terminal performance in the ammo industry, making it a favorite among medium-game hunters. 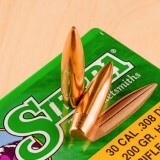 When going through rounds at the range, using a .308 Winchester cartridge can get expensive, so many gun owners choose to reload their brass with these high-quality Match bullets. This box will give you 1,800 of top-quality .308 Winchester reloading bullets. 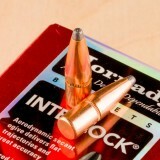 Most reloaders are very familiar with Hornady and it is a favorite brand among target shooters and hunters. 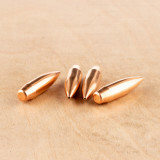 They have a wide range of reloading supplies for center and rimfire rifles, as well as ammo for handguns. 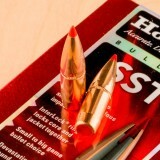 Whether you are involved in competition shooting or need the perfect reloading bullet for hunting, Hornady has you covered. If you shoot these I don't have to tell you how good they are. If you don't, you're missing out on a superb experience. Wideners, no muss no fuss, they always deliver with prices that can't be beat. 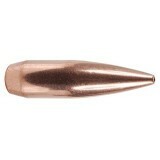 Use this bullet in reloading for 15 years. It is excellent! Reload for 30-06, 308 Winchester, bolt actions and s&w mp 10. Delivers the energy in the animal whether deer or hog. The expanded bullets I've recovered have retained 60-80% of their weight. Groups well at the range and performs in the field. 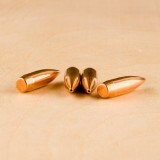 I may try other bullets but I rely on these! Loaded for 300BO and 308, with as much Trail Boss the cartridge would hold. Super quiet, good groups, explosive-but barely mark steel. Fun at supersonic as well! Well within minute of critter. I loaded 50 of these yp and ran them through my 16" AAC 300 BLACKOUT upper. Cycled great, no magazine issues. I loaded them with using 18.9gr lil'gun. Best groups i could get at 100 yards was 1.5"-2" group's. 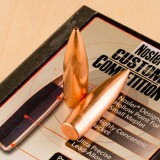 Quality control is good, uniform bullets and weights. These require a fairly high Velocity to function as desired, once these velocities are achieved they function well. They are accurate enough for a hunting round. I wouldn't suggest these if you're looking to shoot in any type of competition. Grouping half to three quarter of an inch at 50 Yards. I haven't done any real ballistics tests of these yet but the bullet weights are all extremely close and no deformation of any bullets in packaging or shipping, tips all in good shape. 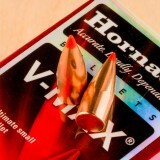 Hornady's A-MAX bullets deliver the best performance and consistency that competition and match shooters demand. 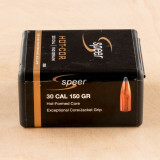 Each bullet in this box of 100 is .308" in diameter, weighs 155 grains, and features a polymer tip. These projectiles have an ultra low drag tip and a secant ogive profile to raise the ballistic coefficient and produce very flat trajectories. 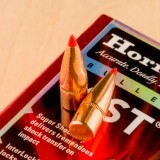 Hornady implements a swaged lead core and their patented AMP jacket to provide excellent uniformity and balance while allowing virtually zero variation from bullet to bullet. 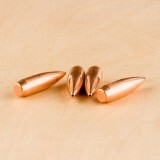 These projectiles have a boat-tail that is customized by caliber to maximize accuracy. The .308 Winchester is one of the most effective rifle rounds for hunting medium game, and largely thanks to whitetail deer hunting, it has become one of the most common ammo choices in the nation. Many .308 rifle owners choose to reload their brass cases to save money, especially when it comes to target practice and competitions, which leads to thousands of empty cases in a single afternoon. 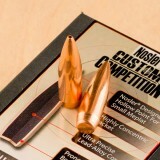 These Custom Competition bullets from Nosler are perfect for brass cases that you intend to take to the gun range. The 168-grain profile makes them extremely consistent when it comes to accuracy, and the hollow point tip delivers high-quality terminal ballistics. With a boat tail, these rounds are excellent downrange. 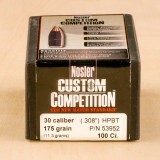 Nosler has many high-quality ammo choices for a huge variety of firearms. They not only make top-quality bullets for reloading, they also make complete cartridges and some of the best rifles available. 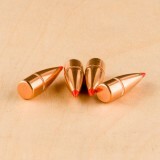 Good bullets ... Good price. 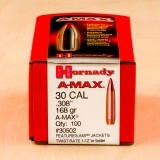 These Hornady A-Max I load just for 600 yards. Works excellent and on game too. 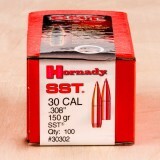 Hornady Super Shock Tip (SST) projectiles are a great choice for most North American game animals. 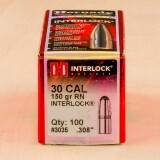 Each bullet in this box of 100 measures .308" in diameter and weighs 150 grains. 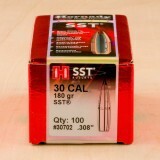 The SST line of projectiles are engineered to deliver massive shock on impact by expanding quickly and reliably. 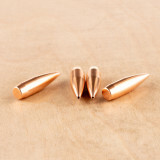 These bullets feature a polymer tip and a secant ogive profile to increase the ballistic coefficient and maintain higher velocities while in-flight. Each projectile also has an Interlock ring that fuses the jacket to the core throughout expansion so there is high weight retention. 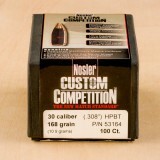 If you have a rifle that takes .308 Winchester ammunition, order this box of 100 bullets from Nosler today for reliable performance and accuracy. These hollow point bullets have a boat tail for enhanced aerodynamics and stability across the projectile's flight-path. The form-fitted, lead-alloy core gives the 164-grain bullet precise balance, further enhancing the consistency of flight patterns. 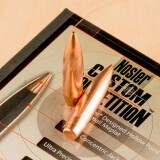 Nosler is one of the top names in the ammunition industry. 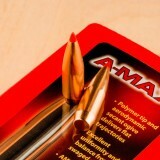 The company was founded in 1948 and started with big-game ammunition. 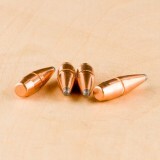 It’s now one of the leading sources for bullets, cases, and whole ammunition. If you are looking for a round that you can use for medium-game hunting like whitetail deer and black bear but can also be used effectively at shooting competitions, then you should consider the .308 Winchester. Since 1952, this cartridge has been a reliable tool for hunters, target shooters, and even the military. Many people choose to reload their spent .308 Winchester brass with fresh bullets, making the sport more affordable and rewarding. 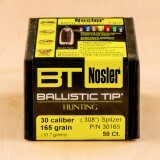 If you are reloading your .308 Winchester cartridges, give yourself high-quality bullets from Nosler. 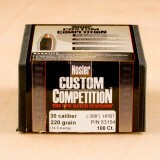 With this box, you’ll get 250 bullets that are perfect for competition shooting. The 168-grain bullets will cycle smoothly thanks to a quality jacket, all while delivering accuracy and terminal performance from the hollow point boat tail profile. 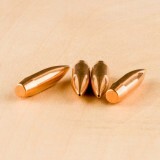 These .308-diameter bullets are reliable in the firearm and at the target. The small meplat ensures superior aerodynamics, enhanced even further by the pronounced boat tail. The form-fitted lead alloy core gives excellent balance while the custom-quality jacket delivers unmatched accuracy. 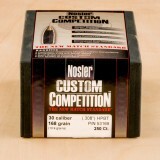 Whether you are reloading your ammo or looking for top-quality cartridges, Nosler is a name you can trust. They have been manufacturing ammo since 1948, providing superior performance to bullets and cartridges for hunting, target shooting, and self defense. 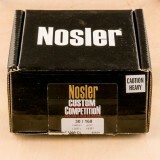 You deserve the best for your shooting sports, so get quality products from Nosler. 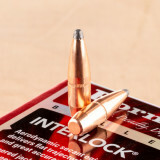 Designed in 1952, the .308 Winchester has been an effective rifle cartridge for both military purposes and hunting. It remains a common sight at American rifle ranges, and has earned a reputation for speed, accuracy, and power. If you are planning on reloading your .308 cases, make sure you have bullets designed to handle medium game like deer and black bear. 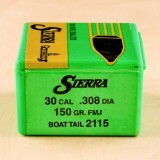 With this box, you’ll get 500 hollow point boat tail bullets that are effective, accurate, and reliable in the field. 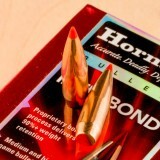 The boat tail on these bullets works to make the projectile more accurate downrange by adding stability, while the hollow point delivers predictable expansion. 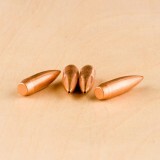 When loaded properly, these bullets gives plenty of energy and penetration, delivering a clean, humane shot. 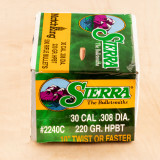 These reloading bullets are made by Sierra, one of the top ammo manufacturers in the country. They have a wide range of rifle and handgun bullets and other reloading supplies that are used for both hunting and target shooting. 155gr SMK rocks in .300 BLK! 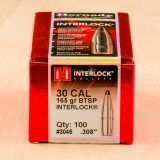 I have been shooting .300 BLK for many years ... it is my "GO TO" caliber! One day I decided to do some more reloading for it and ran across an old box of 155gr SMK's on the shelf so I decided to try them out. Am I glad I did!!! Very comfortable to shoot and Sub-moa groups (even suppressed) right off the bat! The 155gr SMK is now my "GO TO" bullet for my "GO TO" rifle! SUPERB!!!!!!! 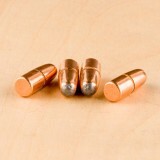 These are exceptionally accurate match bullets with thin jackets. They do not display controlled expansion. 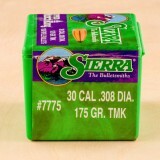 Sierra does not recommend for hunting game animals. I bought these on sale. Smartest purchase I have made in a long time. Few things feel so satisfying as hunting with your own handload -- that your shot reflects not only your skill with a rifle but also your savvy at a reloading bench makes bagging a trophy that much more rewarding. 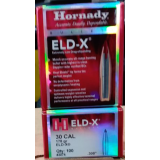 Give your handload the precision performance it needs to demonstrate your all-around proficiency with Hornady’s ELD-X projectile! 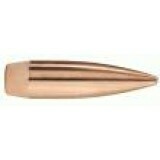 This .308” diameter bullet boasts an exceptionally high ballistic coefficient. Its Heat Shield tip will keep its meplat keen and evenly shaped no matter the velocity it achieves, as the polymer it is made from is immune to the effects of aerodynamic heating. Its accuracy is additionally bolstered by its low drag secant ogive profile, tapered base, and nearly perfectly concentric AMP jacket. The ELD-X’s flat trajectory will enable you to tag a distant buck like it’s standing right next to you. The ELD-X is an all-distance hunting solution. At low velocity impact its tip reliably initiates wide expansion that is made all the more devastating with up to 90 percent weight retention. Even at closer distances the bullet’s InterLock ring ensures its jacket and core stay together to provide some mushrooming accompanied by the retention of as little as half of its weight. It’s perfect for hunting when you can’t reliably predict how your quarry is going to behave, which is practically always. 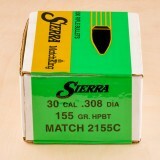 These 168-grain Sierra MatchKing bullets are extremely accurate and reliable. The hollow point tip ensures consistent performance upon impact, while the boat tail increases straight trajectories at a greater distance. 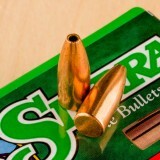 These bullets are often used for varmint hunting, but Sierra insists their best use is at the target range and in competitions. In either case, you'll get reliable performance that should help contribute to a head-ache and hassle free shooting experience. 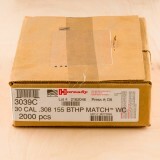 With this box, you’ll get 500 bullets for reloading a wide variety of cases that accept .308" projectiles. 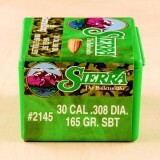 Sierra has some of the finest reloading supplies and accessories available. They have options for both rifle and handgun cases, and even provide reliable information like manuals and videos. This Missouri company has been serving gun owners since 1947. I reload hundreds of 308 ammo and I only use 2 different bullets and this is the main one. Extremely accurate for the distance of 500 yards that I shoot almost daily. 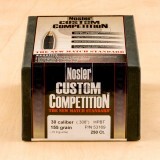 This box gives you 100 Nosler bullets that are excellent for competition ammo. They have a boat tail for maximized accuracy and a hollow point for increased performance at the target as well as maximum expansion. Each 175-grain projectile has a form-fitted lead alloy core and a jacket the delivers smooth feeding and less fouling in the barrel. 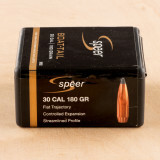 For reduced drag, enhanced accuracy, and superior reliability, these are the .308 bullets that you need. Nosler started as a manufacturer of big game ammunition and now creates a wide variety of ammo for many different calibers. Since 1948, this company has been a reliable source for American gun owners. 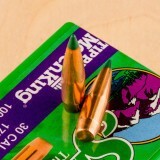 The .308 Winchester is a popular round for both target shooting and hunting. With tremendous performance at the range and reliable terminal ballistics, this round is relied upon by all types of gun owners, from elite competition shooters to seasonal deer hunters. 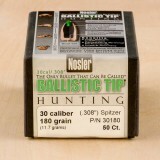 If you shoot the .308 Winchester, you can save on your ammunition by reloading your cases with fresh bullets from Nosler. While the .308 is one of the top rounds in the country for medium game hunting, these bullets are especially effective for competition. You’ll get 500 reloading bullets that are accurate, even downrange, thanks to a boat tail design, which tucks in the back corner of the bullet to increase wind resistance and deliver longer shots before dropping. 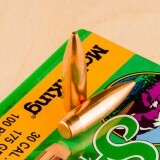 The hollow point on this bullet adds predicable expansion with consistent penetration. The .308 is an effective choice for target shooting and hunting. It has been used to pursue a wide variety of game, including medium-sized animals like whitetail deer, black bear, and pronghorn. 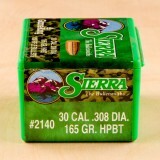 Sierra has been serving gun owners since 1947, providing a large variety of cartridges for both rifles and handguns. 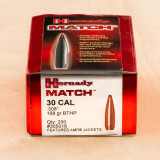 They have top-quality ammo that is used for hunting, target shooting, and competition. The company is based out of Sedalia, Missouri and also provides resources like reloading manuals and videos. 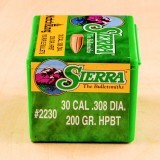 When you need reliable competition bullets for your .308 Winchester cartridges, order this box of bullets from Sierra. 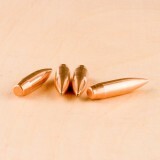 You’ll get 100 polymer-tipped bullets that deliver outstanding precision and power. You’ll be a better shooter and have more success in competition matches with these 175-grain projectiles. 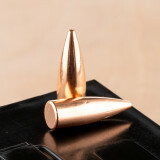 The bullets are crowned with an acetal resin tip, which enhances the aerodynamics while not disrupting terminal ballistics. 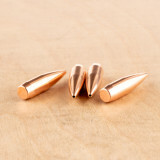 These .308-diameter bullets will help you have record-setting accuracy at the range, making you a more successful target shooter. Whether you fire in F-Class matches or 3-Gun competitions, these bullets will deliver the outstanding performance you are looking for. 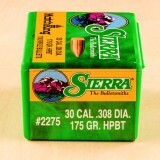 Sierra was founded in 1949 and has been creating world-class bullets ever since. 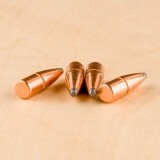 They specialize in rifle and handgun bullets and provide reloading information for all experience levels. 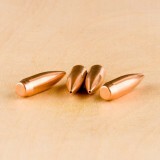 If you appreciate the benefits of ammo reloading, you can have consistent success with these top-quality bullets. 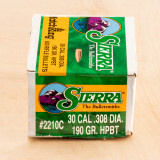 Your hunting cartridges need high-quality bullets that deliver consistency and performance, so order this 50-count box of .308 Winchester projectiles and you’ll be ready to hunt whitetails, pronghorns, mule deer, and more. 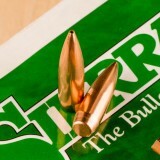 These bullets have a ballistic tip for excellent accuracy and terminal performance, making your cartridges extremely effective in any condition. 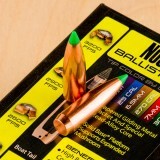 The Nosler ballistic tips on these cartridges are color-coded for easy identification. The fully-tapered jacket allows for controlled expansion while the heavy jacketed base act as the perfect platform for mushrooming in the lead core. Ballistically engineered for outstanding performance, these bullets will help you become a more effective hunter. 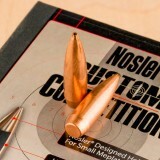 Nosler is ready to help with all of your ammunition needs. 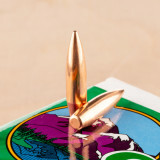 This company is based out of Oregon and has a wide selection of bullets, cases, and whole ammunition. Thanks to meticulous and innovative engineering, Nosler is a trusted choice for many gun owners all across the country. When you are looking for an effective bullet for reloading your .308 Winchester cases, these 190-grain bullets are a great option. They deliver supreme accuracy, outstanding terminal ballistics, and smooth feeding. 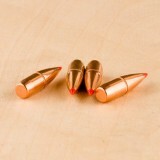 You can count on these bullets in the field and at the range! 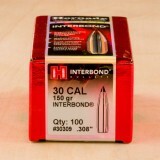 With this box, you’ll get 500 hollow point boat tail bullets for your .308 cases. The hollow point delivers predictable mushrooming on impact, while the boat tail helps with external ballistics, increasing the aerodynamic performance and making it travel with greater consistency. Thanks to a 190-grains, these projectiles are extremely effective at delivering the energy you need for whitetail or other medium-game hunting. 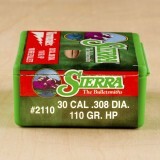 Sierra has been serving the needs of hunters, reloading specialists, and target shooters since 1947. With a wide variety of ammo choices, they are top option for anyone who desires smooth feeding, consistent accuracy, and reliable performance. 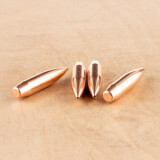 If you use the .308 Winchester cartridge for hunting, reload your empty cases with these 165-grain bullets from Nosler. This box will give you 50 projectiles that have a ballistic tip, tapered jacket, and solid base. These features come together to make one of the most effective hunting projectiles you can find. 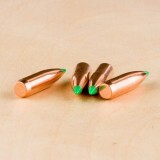 The ballistic tips at the front of these bullets are color coded for easy identification. They resist deformation while enhancing aerodynamics and initiating expansion. The mushrooming is enhanced by the tapered jacket while the lead-alloy core ensures superior expansion size. The heavy base creates a platform for mushrooming, creating a bullet that is extremely effective on the hunt. 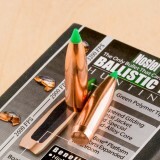 Nosler has been creating world-class bullets since 1948. This company started by creating big-game bullets, but are now a leader in all sorts of ammunition, including target-shooting, self-defense, and competition rounds. They have a wide range of options for nearly every rifle cartridge available. 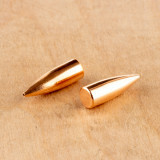 Competition shooters who use the .308 Winchester cartridge for their matches will love these 200-grain reloading bullets. 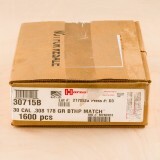 With this box, you’ll get 100 projectiles that are perfect for the target range, delivering the accuracy and performance you need for consistent success in high-volume matches. 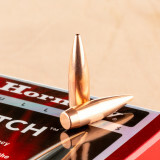 When you are ready for the best bullets for competition, these .308-inch diameter projectiles are right for you. 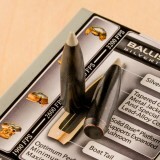 These bullets have a hollow point boat tail design that gives an excellent combination of accuracy and terminal ballistics. The bullet will deliver straight trajectories thanks to the boat tail and narrow hollow point, but it will also result in excellent expansion at the target. These bullets have been used for varmint hunting, but they are best suited for competition matches. 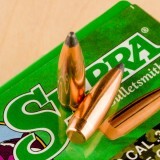 Sierra has a wide selection of outstanding bullets for your cases. Whether you need a long-distance hunting rifle bullet or a projectile for personal defense handguns, Sierra has the products and accessories you need. 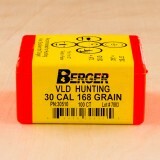 You can load your .308 Winchester cartridges with outstanding bullets when you order this 100-count box from Berger. These 168-grain bullets have an effective design that makes them perfect for hunting medium-sized game like whitetail deer, black bear, and wild hogs. 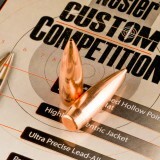 They will give you superior accuracy and ballistics, helping you place the perfect shot to your target. When you load these .308-inch diameter bullets into your cartridges, you’ll have the performance you need for reliable, consistent hunting shots. The boat tail at the back of these projectiles increases the aerodynamic performance, reducing drag and giving you better trajectories. The hollow point ensures controlled expansion so you can deliver effective, humane shots to game animals. If you want precision and performance, you can count on Berger. This ammunition company creates a wide range of reloading bullets for multiple purposes, giving you excellent options for hunting, target shooting, and varmint control.